Nikos Salingaros presents the case for demolishing a modernist eyesore in Rome and replacing it with a high-density, mixed-use New Urbanist neighborhood. 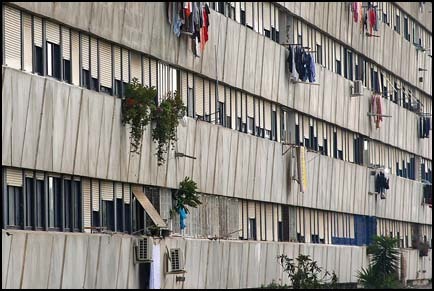 The Corviale building outside Rome is a social housing block that exemplifies the established Corbusian tradition of treating human beings as battery chickens. It was built during 1972-1982 as a single one-kilometer-long building. It is now estimated to house 6,000 people. Apologists who are nostalgic of Soviet-era social experiments continue to defend its paradigmatic modernist design on the grounds that every resident is EQUALLY oppressed in this inhuman environment, an ideal consistent with totalitarian notions of social equality. I am involved in an architectural revolution that is occurring today in Italy, and which may hopefully spread to the rest of Europe and the World. We are proposing tearing down the Corviale and replacing it with new urbanist fabric consisting of 3-5 storey buildings tightly knit together with pedestrian and vehicular connections, and supported by a network of urban spaces and green on the human scale. This comes as a shock to many Italian readers. Immediately after the Italian elections of just a few weeks ago, incoming politician Teodoro Buontempo announced that he is going to tear down the Corviale. The Corviale monster (also called the "Giant Serpent") will be replaced by a high-density mixed-use city. At this moment, we have three very nice projects by three of my friends in Italy: Ettore Maria Mazzola, Gabriele Tagliaventi, and Cristiano Rosponi. These very different new urbanist designs offer three responses to the problem of building new urban fabric and replacing existing urban tissue that is gangrenous. The Corviale site as it is currently planned. This is probably the first time that new urbanist projects are laid out in front of the Italian public accompanied by strong political support. Thus far, the press has conspired with the Universities to bury any traditional urban projects so as to be able to deny their very existence. That way, the architectural establishment could continue to live off the deception that buildings and cities "simply cannot be built that way anymore". Mazzola's project is new (2010). Tagliaventi's project (A Vision of Europe, 2008) was published in magazines and on the internet but was ignored by the mainstream media so that no one remembers it as having existed at all. 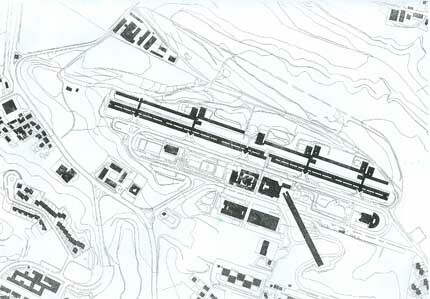 Rosponi's project (Agenzia per la Città, 1997) was presented to the Italian government about 13 years ago, which then included Teodoro Buontempo in a less powerful position than he holds today, but the design was not implemented and was buried in the cupboard by the succeeding administrations. Having three very different new urbanist projects on the table exposes the second great deception of modernist urbanists: the claim that traditional architects supposedly offer the same tired solution which copies old buildings. This self-serving statement is false. 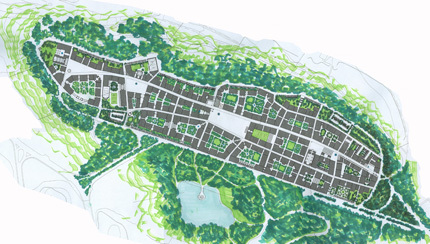 Having discovered the correct mathematical rules for human-scale architecture and urbanism, we can generate an infinite number of adaptive solutions, each one different from the other, yet all comparably human. It is the modernist image-based pseudo-solutions that turn out oppressively similar in their non-adaptivity to human needs. Since all three protagonists are my friends, and I could be involved with the detailed execution of one of the designs when it is chosen, I will not compare the relative merits of these three alternatives. They are distinct in approach and show many interesting differences in implementation. All three are viable alternatives and have valuable urban lessons to teach. 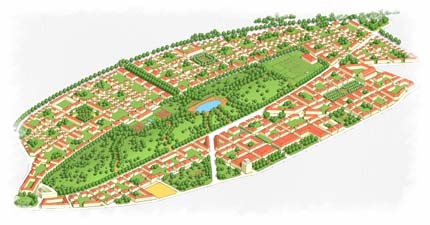 Suffice it to say that we welcome having even more new urbanist suggestions on a new Corviale: even a fourth and fifth design of a living quarter on the human scale, just to show the Italian public the rich variety of adaptive design possibilities without the need for any duplication. All three proposals plan to build one portion of new city, then move some of the residents and demolish the vacated space, repeating this process in stages until the entire Corviale has been replaced. Increasing the eventual total area of habitable space without spreading beyond the original grounds will enable the new urbanist projects to largely pay for themselves. We are facing competition, unfortunately supported by the Italian press as being of comparable value to our more radical proposals for rebuilding, coming from young architects who are still fixated upon formal geometries and propose some superficial changes such as paint, making the wall surfaces look "contemporary", and other palliatives. Those architects haven't learned that the human use of architecture depends upon its basic geometry, not upon surface appearances. It is the inhuman scale of the cement slabs and they way they are arranged that create the Corviale's deadly oppressive environment. The absolutist out-of-scale geometry was wrong to begin with, and that error has to be admitted before the built environment can be fixed. Friendly surfaces are certainly essential, but if placed upon the wrong forms they can never fix the basic problem. Another argument that has blocked previous attempts to condemn the Corviale in the past as an architectural, social, and political failure is the following. Apologists keep mentioning the "incompleteness"of the project, supposedly needing more investment to realize its initial dream (of course); with just some more money everything will turn into a dreamland of joy and happiness. The planned shops on the fourth storey were never completed; the lovely play gardens were never built. But children are happy to play anywhere they feel psychologically comfortable, yet such spaces are sadly missing in the Corviale. Here, the most basic laws of urban structure were ignored, because urban complexity arises through people's movement, which can never occur on the fourth storey. Healthy commerce develops and thrives from network connectivity. What happened instead is that the optimistically labeled "commercial" spaces were occupied by squatters (and still are). Calls for evicting those illegal settlers ignore that they are merely obeying urban pressures to occupy vacant unconnected interior space. The squatters turn out to be better informed about urbanism than the original architects. Commerce did in fact develop as appropriate to the Corviale's geometry of dreary and dark corridors. The Corviale is recognized as a thriving center for the narcotics trade, prostitution, and a variety of criminal activities. The business perfectly matches the architectural and urban form. If you want retail commerce and schools, then you simply need to change the geometry. Tearing down the Corviale is a great opportunity for human-scale urbanism. But there also exist strong obstacles of a deep ideological nature. I urge readers around the world to watch this battle because the modernists and their political allies could choose to make a last stand. It is not simply an argument about a monstrous and ugly building, but about the monstrous and ugly ideology that permitted such a building (and many others like it) to be built in the first place. Losing Corviale to New Urbanism could well represent the beginning of the end of totalitarian rule in urban morphology, and so for the entrenched ideologues, it's worth fighting to preserve it. The Corviale was sadly built just at the time when the US recognized that monstrous social housing blocks were an inhuman mistake, a failed experiment on a massive scale. Pruitt-Igoe in Saint Louis began to be dynamited by the Government in 1972, whereas Corviale was begun at exactly this time. It's a pity that the Italian architecture community did not learn from American mistakes, as it would have saved them a lot of grief. Corviale was called "visionary", a term still used in Italian academia. Urban crimes against humanity are taught to architecture students as examples to follow, and their architects presented as heroes. Severe criticism of inhuman housing projects in Italy over several decades has not made the slightest difference. "Choosing to erect anonymous blocks without the slightest reference to the essential properties of a house, projects are then executed with pseudoscientific accuracy they have been planned, exalted, advertised, and studied in all the universities. 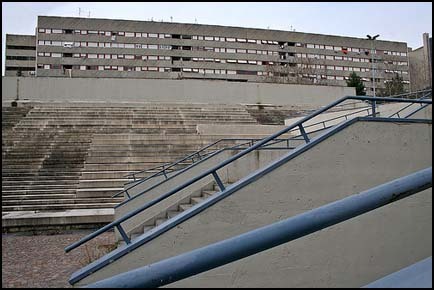 Those projects have been taught as positive examples to students, by architects who have transformed a vision they originally declared to be "ethical" into an "aesthetic" dimension, which ended up as a mix of mechanization and political ideology Four examples of public housing built in Italy: Monte Amiata in Milan, Corviale in Rome, Scampia in Naples, and Zen in Palermo, were condemned by European urbanists in 1991 as being total and abysmal failures. Nevertheless, 15 years later, those very projects were spotlighted in an exhibition of innovative Italian architecture, which toured the major Italian universities. These examples, wherein similar cases gave rise to opposite lessons, underline that the discipline itself stubbornly sticks to a failed ideology." -P. Pagliardini, S. Porta & N. A. Salingaros, "Geospatial analysis and living urban geometry", Chapter 17 of: Bin Jiang and Xiaobai Angela Yao, Editors, Geospatial Analysis and Modeling of Urban Structure and Dynamics, Springer, New York, 2010. Dr. Nikos Salingaros is professor of mathematics at the University of Texas at San Antonio, and is also on the architecture faculties of the University of Rome III and the Delft University of Technology. He is consultant to the Schools of Architecture of the Catholic University of Portugal, Viseu, and the Tecnológico de Monterrey, Santiago de Querétaro, Mexico. Dr. Salingaros is Associate Editor of Katarxis III -- an online journal of New Architecture, New Science, and New Urbanism; the Nexus Network Journal; and the Online Planning Journal. He also ranked 11th in Planetizen's 2009 poll of Top Urban Thinkers.